It’s hard to know where to start writing about Dad’s parents. They are figures in photographs and scraps of stories from I remember from Mum and Dad. A few pairs of crochet gloves and the crochet dressing table set in my room, so how do I make them more real? More real for me, and my children and grandchildren. Mum died when I was fifteen, but when my genealogical curiosity was aroused all those years ago I still had my Dad. Unfortunately like many men he wasn’t the best historian but he did his best and at least gave me a starting point. Later I decided to use my tape recorder to capture some of his stories, regrettably he died suddenly not long afterwards, but I do have one, now very precious, session recorded on tape. I knew the names of his parents and possibly his grandmother, who he called Nanny Fielding. There was also a tantalising mention of a child called Rose. Dad said that her picture had hung in his grandparent’s house. Rose had died quite young, possibly about the same time as Dad’s grandfather. Thus far Rose remains a mystery. George Arthur HARVEY and Florence May PORTER were my paternal grandparents. The Isle of Dog s is surrounded on three sides by a great loop of the river Thames. People here were often poor, some existing just above the poverty line. George’s birth certificate describes his father’s occupation as ‘general labourer’ and he, like most of the inhabitants of the area would have been part of the labour machine that drove the docks. For most, employment was erratic at the best of times and never well paid. Storms delayed arrivals, of the ships that carried tea from China in July and November, Indian tea in August and January, and in September and April Sugar and grain. Minor contractors controlled much of the labour force, hiring out gangs to load and unload the ships. Labourers often a had to bribe the contractor, and desperation often forced them to accept the unmerciful demands of the work boss – after all there were plenty out there to take your place. Unscrupulous company managers increased their status and the shareholders and owners profits by reducing wages. When there was any talk of strike action company managers would just point to the queue of men waiting to take their place. Paid as little as 5 pence and hour men could be ‘called on’ to work or laid off at any hour of the day or night. That is until 1889. This time worsening conditions of work and miserly rates of pay created the right conditions for unionism to succeed. Like the other families in the area, George’s would have felt the impact of the Great Dock Strike of 1889, a year before he was born. With displays of solidarity the striking men marched daily through the streets of London, streets lined with crowds cheering on the determined men, encouraging them to succeed this time. With public support and donations, including thousands of pounds from Australia, this strike succeeded and the men got their ‘Dockers Tanner’, sixpence an hour and eight pence an hour for overtime. 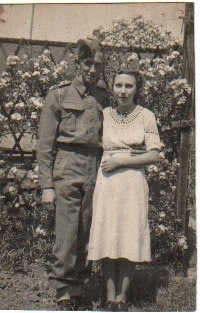 I also knew that both Dad and his father served with the Essex Regiment in WWI and WWII respectively. After a very long wait I now have Dad’s army service record, but WWI service records are few and far between for ordinary soldiers, but I do have a copy of granddads regimental diary to help flesh out the story. More about them later. My parents and sister emigrated to New Zealand with Mum’s parents in 1949. I came along a year later. Not before Mum’s sister and her husband and two children also emigrated. There were other members of Mum’s extended family living in NZ; My maternal grandmother’s two sisters and their families. When my parents were just toddlers Their families lived almost opposite each other in Bekton Road, Canning Town, London. Mum’s family at number 21 and Dad’s at 28. Both grandmothers were good friends, often to be found in each other’s company. Mum’s sister tells a delightful story about them. My two Grans returned home after aan evening out. I wish I knew where they’d been. Whatever it was that took them out, when they got back the door to number 28 was locked and Granddad Harvey had fallen very soundly asleep in his chair. They knocked and knocked and called and called, but couldn’t wake him up. The window of the front room was right there next to them “Let’s open it up and get in that way.” Well, they heaved and pushed and shoved but it wouldn’t budge. A Good Samaritan came to their aid. A Salvation Army Officer walking past saw them struggling and helped them open the window and climb in. They heard him say, “Another soul saved” as he went on his way. Goodness knows what he thought they had been up to. What was she like, my mother? The older I get the more I wonder at the sort of person she was. I miss her more now, and I’m 63, than I ever did when I was 20. Is it perhaps that I realise the potential for the relationship, as the relationships with my own children continue to develop and change? I was fifteen when she died. From what I remember about that age I was a normal obnoxious teenager; more interested in, and influenced by my peers, than my parents. I want to tell her story, and Dad’s. I want my grandies to know a little about these two special people, not just the bare facts of when and where they were born and died. I came across this blog challenge in a FaceBook post...and I thought what a great idea. I wonder if I can catch up...well I'll give it a jolly good try.